Taoreed and his assistant, a motor boy, on the day he absconded with his company bus, had gone to distribute bags of sachet water to buyers on June 30th but after carrying out the task, he deceived his assistant by telling him that he wanted to withdraw money from a bank in another location at same Bodija area. 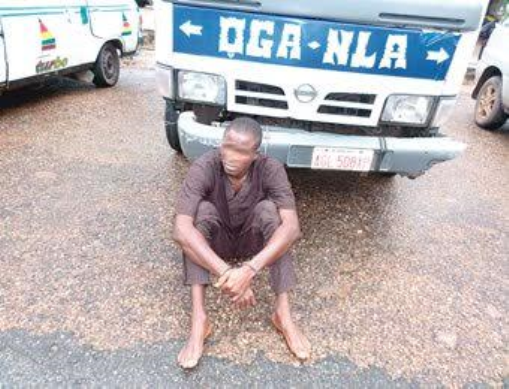 After he parked the vehicle, the unsuspecting conductor also alighted to transact business in another bank, but before his return, Taoreed drove the vehicle to an unknown place and was not seen again until his arrest, Oyebade stated further. Jimoh was arrest and the vehicle was recovered at Irawo Owode. On recovery of the vehicle,Jimoh had removed the inscription that was originally on it and replaced it with Oga Nla which means Big Boss.